Many of my financial strategies involve patience and self-control. Heck, even attaining an emergency fund takes patience and self-control. Where understanding how patience has the most payoff is when you’re invested in the stock market. All too often people set themselves in positions where they sell too low and buy too high. When you’re in stocks, you must have a long-term strategy and exhibit a fine display of fortitude. I’ve been investing for just over five years now, and have had the opportunity to witness the market’s epic fall to its recent bullish state. After taking a look at the data associated with past investments, it is easy to see how investing in reliable stocks over the long-term can be one of the most reliable investment strategies. This is in stark comparison to the day traders and people who are compulsively (or more methodically) buying and selling often. Investors often don’t account for the transaction fees associated with a buy and sell and can lose quite a few gains strictly to the fees! You may be asking how shaving relates to investing. I recently received a safety razor set for Christmas and have taken to learning to shaving with it. Since I’ve gotten it, I’ve learned to practice even more patience and put time and care into learning to shave to avoid all the cuts and missed whiskers that can be associated with a fast and careless shave with one of these puppies. I’ve translated these learnings to my own investments strategy and I think the persistence and patience translates well into ensuring that you don’t buy and sell rapidly or try to time the markets even when they turn bearish. I really liked the analogy of shaving with the stock market. 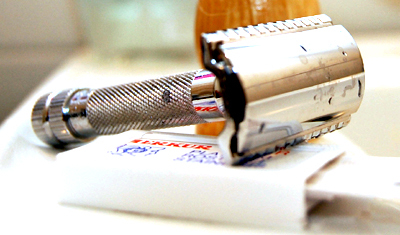 If you are new to shaving, you may cut or nick yourself the first few times you do it. This is much like learning the stock market for the first time. Also shaving a new area, such as the chest or legs, is like exploring a new or foreign market. I myself am relatively a hairy person right now and dont have alot of experience in stocks. It is very impressive that you started so young. Awesome continuation with the analogy of shaving new places and foreign markets! I love it! In the same vein, you would have never learned to shave unless you had actually grown a few hairs. Investing really is the same way, just by shaving a few new hairs (putting some side cash in the market every now and then) can propel your investing career and can help you maximize your gains! You want to refine your investment strategies, take your mega losses when you are only investing to “learn”. You might hit a few times, and then lose a lot (looking at you SpongeTech) – always be refining your investment strategy.